Safety, efficiency, and cost effectiveness of projects are things that you need to consider when looking for an electrical contractor. Choosing an electrician can be difficult. Henry Electric brings years of experience to the table, with a strong team of eletricians ready to meet your immediate electrical needs. Call us at 717.757.7694 Today! services the York PA area (includes York, Lancaster, Harrisburg, Reading, and northern Maryland) and is a family owned and operated company. of construction has been Henry Electric’s primary concentration, but residential and industrial work are also a significant part of Henry Electric’s operations. requires an experienced professional on the job. 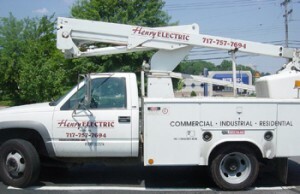 Henry Electric has a team that prides itself on completing jobs in a timely manner. Henry Electric has the manpower and capital to complete projects up to $500,000. Our promise as Electrical Specialists is to build community value into every project while delivering professional expertise, exceptional customers service and quality solutions.